New Blog by Alice Shannon, MFT. "Listening to Temperament." January 16th, 2019. Alice is a long time advocate for the use of temperament concepts in her clinical practice in northern CA. She contributed the Teaming up to Tame a Preschooler article in the Clinical section of the B-DI website and has written several guest columns for the B-DI Newsletter. Alice's stated purpose for her new site: "I want my blog, Listening to Temperament, to provide personal and professional access for understanding temperament, and for learning to tap into this underutilized resource as a wellspring for individualized insights and solutions for day to day well being and as well as greater life challenges." 22nd Occasional Temperament Conference: Murcia, Spain, May, 2018. Updated June 18, 2018. The 22nd Occasional Temperament Conference was held at the University of Murcia, Spain, May 3-25, 2018. It was hosted by Jose Antonio Carranza and Carmen González-Salinas, from the University of Murcia, and Charo Rueda, from the University of Granada. In accordance with the selected theme, a multidisciplinary approach to the study of temperament, this meeting brought together a variety of research addressing temperament from different disciplines, including Neuroscience, Personality and Developmental Psychology, as well as studies of application in clinical and educational settings. In this occasion, two outstanding researchers were invited. 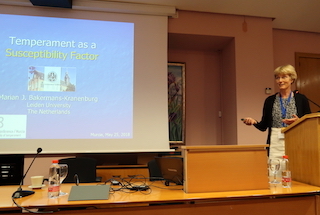 Marian Bakermans-Kranenburg (Leiden University), keynote speaker, reviewed correlational and experimental evidence for the concept of differential susceptibility. 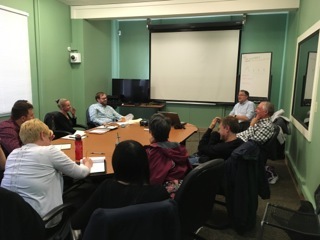 Nancy Eisenberg organized a roundtable oriented to reflect about conceptual issues, and the contribution of temperament to the study of psychological development. Additional components of the panel were Marinus Izjendoorn (University of Leiden), Liliana Lengua (University of Washington), Marcel Zentner (University of Innsbruck), Reinhard Pekrun (University of Munich), and Carmen González-Salinas (University of Murcia). The Jan Kristal Memorial Award was introduced by Sean McDevitt and given to Barbara Medoff-Cooper and Liliana Lengua to acknowledge their important contribution for the welfare of children. Masha Gartstein kindly summarized Liliana's professional and academic trajectory, and we could congratulate Liliana personally. The preconference workshops addressed varied topics concerning research and practice on temperament. Jose A. Lopez-Lopez (Bristol Medical School; meta-analysis), Brian French (University of Washington; multilevel modeling), Sam Putnam (Bodowin College; test construction), Scott Frohn (University of Nebraska; test construction), Sean McDevitt (psychologist, Arizona; temperament and parenting in referred children), Irina Trofimova (McMaster University; temperament and mental disorders), and William Sulis (McMaster University; temperament and mental disorders), generously introduced us to their respective topics. Thanks to the joint efforts of the conference organizers, scientific committee, preconference leaders, conference speakers, and poster presenters, we enjoyed an exciting scientific program. More international participation was encouraged this year, resulting in a record in the number of attendees (more than 100) that came from about 25 different countries. However, we missed the TC members who couldn't make this conference. We sent warm messages for Bill Carey and Mary Rothbart in a special postcard we printed for them. The scientific agenda was complemented with joyful activities, such as the gala dinner at the Real Casino de Murcia, the guided city tour, and the day trip to Cartagena and the Roman Theater. The city of Murcia was quite animated during these days, as “The Three Cultures Festival” (Jewish, Muslim, and Christian) offered street music and dance. The 20th Anniversary of the B-DI Newsletter for Parents! Posted August 6, 2017. BDINews-Caring for the High Maintenance Child, By Kate Andersen is hosted by Yahoo Groups. The free monthly newsletter for parents has been providing information about temperament and dealing with high maintenance children since 1996. With topics ranging from behavioral adjustment to communication, social skills and family problems, the topical issues have been read by thousands of parents looking for help with their spirited child. BDINews can be downloaded or printed without charge using links to html format and pdf format files at the top of the newsletter pages. These files may also be distributed by parents or professionals to anyone in need of the information. New Carey Temperament Scales Questionnaires. Posted December 14, 2016. Questionnaire Update: New Format and Design. William B. Carey, MD & Sean C. McDevitt, PhD, and Associates. The questionnaires were updated in layout and format to make them easier to read and more convenient to score using CD and online software. The categories and norms remain the same as in the original versions. For additional information go to the CTS Information Page. Child Behavioral Assessment and Management in Primary Care, Second Edition. Posted June 22, 2016. 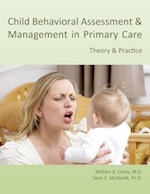 Based on the 2012 first edition, the second edition of CBAM offers new content, including an outline of areas of behavioral adjustment in the 0-4 age range and a more detailed review of the application of temperament counseling. A new chapter deals with the confusion of terminology that has crept into the behavioral health field in recent years. Mobile and print versions are also available. The 2012 book by William B. Carey, MD and Sean C. McDevitt PhD was favorably reviewed in a recent issue of the Journal of Developmental & Behavioral Pediatrics. Roxanne Almas, MD from Brown University/Rhode calling it "clear and user-friendly, which makes it highly accessible to a busy pediatric primary care clinician." She stated: I found the discussion of the impact of temperamental variability on a child's behavioral profile helpful. This perspective can help parents understand their child's behavior and ultimately guide clinicians to appropriate clinical interventions. See links below for copies of the review and the book. Click here to get a PDF copy of the review. Free PDF copy of the book is here. An idea expressed at the last OTC meeting in Nebraska was that the TC group might benefit from having a TC Directory where members could post their names, affiliations and a link to a webpage. The idea was that work they are doing with temperament, and possibly initiate collaboration/exchange that would be mutually beneficial. In addition, members of the public could see the disparate and interesting things that are being done in the temperament field. After some initial testing, the new TC Membership directory listing is now available. About 75 of the 360 listserv members have opted to list for the inital launch. Others, and new members, are eligible to join the Directory at any time. Report of the OTC 21 Meetings from the Organizers. Posted December 14, 2016. The theme of the 2016 Occasional Temperament Conference was “Temperament across the lifespan: From biology to intervention,” with the goal of integrating basic biological, behavioral and mental health research with their translation to prevention and intervention. This meeting included several preconference events, offering clinical and advanced quantitative training, with a record number of conference attendees and community members taking advantage of these OTC opportunities. The conference consisted of 8 symposia and over 20 poster presentations, all informing the audience regarding current scientific inquiry into temperament and related fields. The keynote address given my Nathan Fox was particularly illuminating, spanning the spectrum of studies addressing the development behavioral inhibition and highlighting the work of his prominent former students. Jan Kristal award recipients broke new ground as well, with the work of Jack Bates and Kåre S. Olafsen, the first academic and the first European colleagues recognized at this meeting. In another innovative move, this meeting was co-hosted by Liliana Lengua (University of Washington) and Masha Gartstein (Washington State University), who shared responsibility for planning the meeting. Seattle proved to be a worthy destination, providing many tourist attractions along with information shared at the OTC sessions. As is customary, the next location was discussed at the planning session at the end of the meeting, with potential future sites including US and European destinations – stay tuned! OTC 2014 held in Lincoln, Nebraska! Posted November 19, 2014. The 2014 OTC meeting held last weekend in Lincoln, NE was superb! A gathering of 60+ professionals in the areas of research, practice and education attended a preconference, 8 symposia, 15 posters and a keynote address by Jack Bates. Attendees came from as far away as Australia, Spain, Poland and Mexico City. Sandee McClowry and Helen Neville each received a Jan Kristal Memorial Award for application of temperament to benefit children. Kathy Rudasill, the organizer, along with a group of dedicated students did a marvelous job of hosting the meeting and assisting with local arrangements. This conference will be remembered in particular because of her Nebraska Nice! hospitality. A planning meeting was held at the end of the conference to discuss the date and location of the next OTC. Kathy also requested that presenters share their slides, and will post these and photos taken at the meeting in the near future. Click here for Conference details. Click here for copies of slides and presentations and to view photos. Upgrades to web-based assessments & ATQ2 iReport Writer. New norms based on 6400 subjects! Updated in 2008 and now again in 2013, the ATQ2 online is based upon norms established on over 6400 adults who have completed this questionnaire. The self-assessment process allows users to select the norms that will be used for their temperament profile (e.g., college age males, females in their 40s, etc.) or to use the original, now called 'classic,' norms. Profile category descriptions are based upon five levels for each of the nine scales, allowing for finely grained statements about temperament for each individual. Further refinements make the ATQ2 easier to use. New auto-advancing during questionnaire input and pre-submit entry checking reduce user errors. New printing capabilitites enable one click printing of the 3 page reports or creation of a pdf file version of the ATQ2 report. Click here for ATQ2 information about the online web assessment. Click here to view the ATQ2 2013 edition iReport Writer options. Posted November 6, 2008. The ATQ2: Same Instrument with New Norms and Profiling. The Adult Temperament Questionnaire provides information regarding the temperament of adults, and is based on the landmark research of Drs. Alexander Thomas, Stella Chess and associates in the New York Longitudinal Study. Categories of temperament or behavioral style indicate how the individual responds to the environment around him or her, the how of behavior. Research has shown that infants, children and adults differ in a consistent way from one another on these dimensions and that these characteristics are part of the foundation of individual personality. The new ATQ2 uses 9 categories to describe these reactions: activity level, regularity, adaptability, approach to novelty, emotional intensity, quality of mood, sensory sensitivity, distractibility and persistence. This 54 item self report questionnaire was distilled from questionnaire items used with the original NYLS sample as part of the early adult followup studies. In 1998, the original ATQ was standardized on the NYLS sample and initial reliability was established. Over the first 9 years of use by clinicians and researchers, the ATQ was utilized in clinical and academic research settings, and data were collected on over 3000 individuals. In 2008, the ATQ online was updated to incorporate user experience and feedback. Broader norms were established, based on over 3400 adults who had completed the original questionnaire. The process now allows users to select the norms that will be used for their temperament profile (e.g., college age males, females in their 40s, etc.) or to use the original, now called 'classic,'norms. Doing this adjusts the user's profile comparisons to an appropriate age and gender reference group, resulting in a more meaningful interpretations. In addition profile category descriptions have been extended from three to five levels for each of the nine scales, allowing for finer grained statements about temperament for each individual. The ATQ online questionnnaire now allows users to purchase access codes for future ATQ web profiles so that a significant other, a class of students and/or clients in a private practice can be referred for their own temperament profiles. Discount pricing allows for larger numbers of access codes. Hand scored practice sets and refill sets now include access codes for a virtual profile sheet call ATQ iProfile. By entering the raw scores and impressions online, a custom profile sheet is created using the age and gender norms selected for comparison. What options are available for accessing the ATQ 2nd Edition? Professional Practice Sets with Test Manual, User's Guide with questionnaires, scoring and profile sheets. Click here. ATQ2 iReport Writer software uses and iReport Writer practice sets.Click here. Questionnaire refills, with and without scoring and profile sheets.Click here. ipasscode.com-ATQ2 referrals can be made for clients. Now available!Click here. Online self-test on the www.b-di.com home page. Get additional access codes for others.Click here. CBAM: A New Book for Professionals. Child Behavioral Assessment and Management: Theory & Practice. This book, written by two clinicians who have worked for many years in primary care, suggests that health care professionals should view children's behavior as a spectrum where normal conflicts shade into problems and then disordered behavior, rather than making a categorical judgment about whether symptoms being presented by the caregiver are severe enough to diagnose and treat as an abnormal condition. Attendance was about 80, larger than the usual 50 or so, bigger but not too big. The usual friendly atmosphere prevailed and there was sufficient time to discuss matters formally and informally. Participants were the usual mixture of academic and clinical practitioner researchers, coming from all over the USA, several countries in Europe, and elsewhere. The program offered various aspects of temperament research. Theoretical investigations covered environmental effects on, and interactions of temperament with, family, school, and culture and physical ones like intrauterine cocaine exposure. Discussion of clinical applications included problem solving in pediatrics, nursing, clinical psychology and education. Other discussions focused on "What is temperament now" and temperament-cognitive links. The 24 posters offered further views. A novelty this year was three simultaneous preconference workshops on person-centered analysis, clinical applications, and cross-cultural data. Previously we have avoided splitting up the whole group in any way in order to avoid creating factions. I believe, however, that this year's experience demonstrated that such special interest sessions are a valuable addition to consider repeating next time. Another innovation was the initiation of the Kristal award. This was named for Jan Kristal, who hosted the previous OTC meeting in 2008 in San Rafael, CA, but who died of cancer shortly after. The intention was to recognize at each OTC meeting a person who like Jan has made significant contributions to the clinical applications of temperament research, which is much in need of encouragement. The ad hoc committee (who excluded themselves from consideration) decided on three recipients for this year in order to catch up after 12 years with no such recognition. Those honored: Barbara Keogh, Jim Cameron, and Sean McDevitt. We expect this to become a regular part of the OTC. Plans for the future-After each OTC there is always a scramble to decide where the next one should be held. We make it up as we go along. For the present there seems to be a consensus for keeping the meetings in the USA and resisting the allure of holding them in Europe. There have been several independent temperament meetings over there (London, Como, Leiden, etc.) but no recurring series like ours. Many participants are concerned that we would lose the involvement of our younger researchers who are less able to afford the expenses of transatlantic travel. Two possible prospects for 2012 are Salt Lake City and Seattle. We await further details of these and other potential proposals. OTC 2008 was held October 17-18, 2008 in the San Francisco Bay area. The meetings were organized by Jan Kristal at Dominican University in San Rafael. This event marked the 30th year since the first occasional temperament conference, held in Lund, Sweden. The conference theme was: Research and Clinical Applications across the Lifespan. The meeting was attended by 50+ clinicians, researchers and students, with attendees from all around the US and Europe. Notable temperament researchers such as Mary Rothbart, Roy Martin, Berit Hegekull, Ivan Mervielde, Sara Harkness, Charles Super, James Cameron, Diana Guerin, Sandee McClowry and others were in attendance as were clincians such as William Carey, Elaine Aron, Sean McDevitt, Jan Kristal, Helen Neville and Alice Shannon. Commentary was provided by Mary Rothbart, William Carey, Hedi Teglasi and Xing Zhou. The schedule of presentations at the meetings can be found at the OTC website. Click here to visit the OTC 2008 website. A memorial service for Dr. Chess was held on Wednesday, September 19th at the Farkas Auditorium at NYU Hospital. It was attended by over 100 colleagues, friends and family members from around the country. The service included musical offerings by violinist Yeou-Cheng Ma, MD, who performed selections by J.S. Bach. Speakers included a number of current and former NYU colleagues of Dr. Chess: Drs. Ted Shapiro, Margaret Hertzig, H. Paul Gabriel and Richard Oberfield. Dr. William Carey of the University of Pennsylvania Medical School presented a tribute from a non psychiatric contemporary. Final comments, warm and poignant memories of being raised by two psychiatrists, were given by Stella's son, Kenneth Thomas. A luncheon followed. Dr. Chess died in March of this year at the age of 93. Click here for a copy of Dr. Carey's tribute to Stella Chess. 10/18/2006: IPASSCODE.COM ONLINE BEHAVIORAL ASSESSMENT BY PROFESSIONALS! B-DI announces the opening of ipasscode.com, a new online database of behavioral assessements designed for use by professionals in practice. The database is available for all licensed or credentialled behavioral health professionals. Professionals who work for qualified organizations and institutions (hospitals, clinics, school districts, etc.) may also use the system. Professionals register to use the website and then are able to refer subjects (patients, clients or students, depending on the setting) to the site using a passcode referral. The passcode is a unique combination of letters and numbers that recognizes the subject, professional and test needed, and allows it to be completed online. The results are then transmitted directly to the referring professional for followup with the subject. ipasscode.com is completely secure and uses the same encryption used by banks and financial institutions to protect sensitive data. The database can be used with self report, caregiver/parent rated and teacher rated instruments. Tests on the site include all of the current B-DI assessments, including the Carey Temperament Scales, Adult Temperament Questionnaire, BBAS, etc. as well as well known questionnaires by leading clinicians. These include the Beck Depression and Anxiety Scales, Brown ADD scales, Beck Youth Inventories, and Parenting Satisfaction Scale. Other instruments, including the Sensory Profile questionnaires and SASSI Adult and Adolescent, substance abuse screening inventories, are being prepared for the site. Additional test measures are being contracted. To visit ipasscode.com click here for professional registration and login. The organizers of OTC 2006 have announced the dates for this year's meetings, scheduled for October 12-14, 2006 in Providence, RI. The conference will be held at the Center for the Study of Human Development at Brown University. Program organizers are Ronald Seifer, PhD and Judith Bandieri. The registration form and complete information will be posted on the Center for the Study of Human Development web site in the near future. A number of leaders in temperament research and clinical applications in practice gather at OTC to present papers and discuss issues in the field. Attendees will include professionals and students interested in temperament research as well as clinicians and practitioners. OTC meetings offer a rare opportunity for academicians and practitioners to interact on topics of mutual interest. The new CTS iReportWriter2 online scoring software adds a new set of capabilities to the original iReport Writer system. Based on feedback from current users, the iReport Writer2 adds encrypted scoring, form checking to reduce errors, increased browser compatibility, and improved html coding for cleaner 'on screen' and printed reports. new clean html coding provides sleeker 'on screen' and printed reports; Current users will be upgraded free of charge and be able to select either the new system or continue using the old one. Order numbers and prices for CTS iReport Writer2 software will remain the same. New users will receive information on both login locations. All CTS iReport Writer software sold after the release date (3/22/06) will include access to both scoring systems! Click hereto see the options for using the new CTS iReport Writer2 in processing questionnaire data. Based on the internet Report Writer technology, the new CTS Version 6 software scores any of the five CTS questionnaires and generates 2 attractive temperament reports, one for the professional and one for the caregiver. The software comes in 3 versions, PC, Mac OSX and Mac OS9. It is available in 25 or 100 use versions on CD. Both temperament reports include a temperament profile and interpretations of temperament characteristics. The caregiver report is personalized for age and gender of the child and uses the youngster's first name in behavioral descriptions. The professional report includes validity checks for missing data, social desirability and ratings/perceptions discrepancies. Click here for additional information about CTS software included in the 2005-6 B-DI catalog. The organizers of OTC 2004 have posted a website for attendees at the conference, scheduled for October 28-31, 2004 in Athens, GA. A conference program and informational brochure are available in pdf format at the site. A number of leaders in temperament research and clinical applications in practice are scheduled to present papers. Attendees will include professionals and students interested in temperament research as well as clinicians and practitioners. OTC meetings offer a rare opportunity for academicians and practitioners to interact on topics of mutual interest. Click herefor information about registration at the conference. Programmers at B-DI are working with ISS2000, a professional web design firm, to upgrade the iReport Writer experience. New login, selection, and questionnaire pages have been completed and the Caregiver and Professional reports will soon be getting a new, more attractive and functional look! The CTS iReport Writer allows professionals to score and interpret the Carey Temperament Scales questionnaires online from any internet connection, using just standard browser. Reports can be received instantly and are archived at B-DI for later retrieval and use. No minimum computer requirements or upgrades are necessary, and there are no shipping or handling charges on iReport Writer uses. A ceremony celebrating the life of Dr. Thomas was held on March 24, 2003. It was attended by over 100 colleagues, friends and family members. Dr. Thomas was remembered for his innovative research in temperament and his courage in challenging the conventional wisdom of the time, behaviorism and psychoanalysis, for which he was soundly criticized. Speakers included William B. Carey, MD, Sidney Thomas, his brother, and his three sons. Musical interludes were played by violinist and developmental pediatrician, Yeou-Cheng Ma. A reception followed. See links to Dr.Carey's remarks and photos of the ceremony. 12/1/2002 : BASICS is here!!! Symptoms category screens for problems in areas of physical functioning including eating, sleeping,elimination, etc. The BBAS was developed by William B. Carey MD and Sean C. McDevitt, PhD and standardized on 415 children aged 4-14. Norms indicate how a specific child is functioning compared with others in the same age group. The scale has good internal and retest reliability and there is evidence of discriminant validity in clinical vs. nonclinical subsamples. Dr. Carey presented a paper on BBAS at the recent 2002 Society for Developmental and Behavioral Pediatrics meetings in Seattle, Washington. BBAS should provide clinicians an efficient method for organizing the behavioral characteristics of children in this age group, focusing on strengths as well as problem areas and identifying behaviors highly relevant to emotional and behavioral functioning. Click here to learn more about obtaining BBAS. By request, iReport Writer now comes in the Carey Temperament Scales Practice Set version with questionnaires, Test Manual and User's Guide. Practice sets are typically purchased by new users of the CTS. Now iReport Writer technology will be available to new users as well! 4/4/02 :iReport Writer is here! Now users of the Carey Temperament Scales have a new utility for scoring and obtaining reports from CTS questionnaires. iReport Writer provides the ability to generate sophisticated temperament profiles and written reports using web-based Report Writer software. The system allows input of questionnaire data into a browser form (e.g., Internet Explorer) and processes it on the B-DI server, returning a report right in the browser window. A demonstration page has been developed to show the feature of the iReport Writer system. Click here for details on products available and demo pages. Click here for details on products available and demo pages. 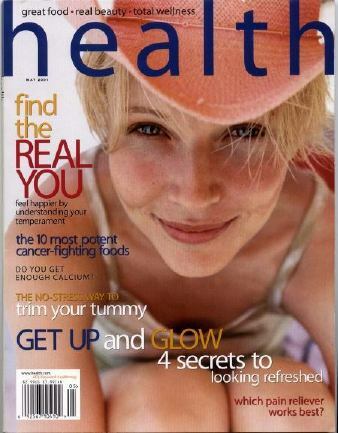 As seen in Health Magazine, understanding temperament can help find the real you! The NYLS Adult Temperament Questionnaire is now available on the web. The 54 item questionnaire can be accessed, scored and interpreted in minutes online. The ATQ returns scores on same the nine temperament dimensions that are measured in infants and children with the Carey Temperament Scales. Unlike the CTS, individuals may self-refer and complete the questionnaire independently, without the involvement of a professional person. The scoring service costs $12.00 and is prepaid by credit card. The temperament profile and report appear on the browser screen within seconds of completing the questionnaire ratings. A confirmation number emailed to the individual allows retrieval of the profile for 1 year following completion. The 14th Occasional Temperament Conference will be held October 4-6, 2002 in Newport Beach, California. OTC 2002 will be hosted by Diana Wright Guerin, PhD and colleagues from the Department of Child and Adolescent Studies at California State University, Fullerton. Get details on the meetings page. William B. Carey, MD recently spoke to the American Enterprise Institute panel on the prescription of Ritalin for the treatment of ADHD. The hearings were to determine whether a conspiracy existed between the drug companies and the American Psychiatric Association to promote use of stimulant medications. Dr. Carey's remarks emphasized the problems that still exist today in making the diagnosis and providing appropriate treatment for children who have the disorder without diagnosing and treating normal temperament variations as if they reflected ADHD. Click here to read Dr.Carey's remarks. TACTIC is a 97 item rating scale that assesses temperament and screens for attentional and behavioral problems in children 2 to 6 years of age. The questionnaire is completed by the preschool teacher or other caregiver and rates the nine NYLS temperament characteristics while also screening for conduct, emotional and attentional problems. It is anticipated that TACTIC will be used by professionals who require unbiased ratings of behavior from a caregiver in an out-of-home setting, and will serve as a basis for both assessment of the child and consultation with the caregiver. TACTIC will be unveiled in November at the Zero to Three National Training Institute in San Diego, California. Conference dates are 11/30-12/2. The TACTIC poster with information on standardization data and availability will be accessible throughout the conference. Programmers at B-DI have identified a fix for Error 200, the bug in the programming language Turbopascal that prevented CTS software from running on computers with processors faster than 250 mhz. The fix involves applying a patch developed in Europe to circumvent the division by zero that afflicts all programs written in Turbopascal. Testing of the patched programs has been successful at processor speeds up to 1 gigahertz. New software produced after November 13, 2000 will be patched and labelled 'V 4.2P' The patched program provides new options for users of CTS questionnaires, as limited use diskettes will continue to be available. Version 5 is currently available only in unlimited use versions. Prices and product offerings for Version 4.2 will remain the same. 01/31/2000 : New B-DI Publication Now Available! This manual by Kate Andersen, author of BDINews, has just been published by B-DI. The Temperament Guides provides an effective, temperament-based program ("Your Individual Child") for practitioners working with young children and their families. It includes a chapter on the practical aspects of temperament assessment by Sean McDevitt, PhD and a Foreword by William Carey MD. Looking systematically at behavioral issues related to each of the nine temperamental characteristics, it also examines the role of temperament in 10 of the most common childhood behavior problems. In addition, The Temperament Guides includes 40 reproducible parent education handouts for use in early intervention. 5/15/99 B-DI and Y2K: CTS Version 4.2 Released! Y2K ready! Last Version of DOS-based program. Diskette exchange offer! Version 4.2 of the Carey Temperament Scales is now available. It includes 4 digit dating for birthdate and date of assessment, bug fixes and updated report formatting. Although not technically a Y2K problem since it doesn't use the computer's system date, all previous 2 digit date versions will give incorrect age parameters after the Millenium (starting on 01/01/2000). Version 4.2 corrects that problem, ensuring trouble-free use well into the next century. Version 4.2 is the last DOS-based version of the CTS software, due to problems with Microsoft system software. As Microsoft has updated the Windows operating system, some changes have created incompatibilities which prevent use of the CTS software on some of the newer versions of Windows 95 and Windows 98. CTS Version 4.2 will run on all systems that currently run V4.1, but incompatibilities may still occur with newer Microsoft Operating System software. Since its introduction in 1996, tens of thousands of DOS-based CTS software uses have been sold. All users whose software now operates properly with the Microsoft software may want to take advantage of the diskette exchange program described below. A totally new Windows-based version of the CTS software, Version 5.0, is being written to allow wider use of the program with PC systems. Release date is scheduled for early 2000. The current adult ATQ software_is_Windows-based and has no Y2K issues to resolve. Nor are there any reports of incompatibility of the ATQ software with any Microsoft operating system. Because of its similarity to the ATQ program, CTS Version 5.0 should eliminate any problems of compatibility with Windows. In the meantime, owners of all current DOS-based CTS software may upgrade to Version 4.2 for only $49.95 per diskette (plus s&h), no matter where the original program was purchased or how many uses are left on the diskette! The original diskette will be replaced with a fresh V4.2 diskette of the same type (e.g.,Report Writer, Profile Writer or Quickscore) and restored to the number of uses originally purchased. Users are reminded to remove all .txt files (including save.txt, which contains the data for the last protocol) before submitting diskettes, to preserve confidentiality of client names. B-DI,14636 North 55th Street, Scottsdale, AZ 85254. 2/1/99 : ATQ Software Released! B-DI is pleased to announce the release of the software for the NYLS Adult Temperament Questionnaire. The program is available in 25 use and unlimited use diskettes. The ATQ software administers, scores, profiles and generates individualized reports of temperament characteristics in adults. The ATQ software can also be used to score questionnaires taken with the printed ATQ questionnaires in 2-3 minutes, eliminating hand scoring. The ATQ software has the unique ability to self-administer the questionnaire from a regular or laptop computer, eliminating the need for printed questionnaire forms. Report output includes two reports, one for the subject and a second, more detailed report for the professional. The latter includes scores on each temperament dimension, a temperament profile and interpretive statements based on the individual's profile scores. For professional users, passworded validity checks can be accessed and included in the printed professional report. Two B-DI products incorporating the ATQ software are available: 1) the 25 use ATQ Report Writer at $149.95 plus shipping and handling, which includes the Test Manual, User's Guide, 25 print questionnaires and software with 25 uses (ATQRW25), and 2) the Unlimited Use diskette with 100 print questionnaires, Test Manual, and User's Guide at $495.00 (ATQRWU), plus shipping and handling. Orders for these new products can be faxed, phoned or mailed. Online ordering capability is also available at shoppingindex.html. Be sure to use the order numbers listed above when sending your written request. "Is ADHD a valid disorder?" Carey criticized the definition and treatment of the ADHD disorder on the grounds that there is no provision for taking normal temperament variations into account. His remarks are reprinted here and the full text of his review paper on the subject is reprinted here. 10/26/98 : BDINews Electronic Newsletter! B-DI announces publication of Behavior-Development-Individuality, a Newsletter for parents and professionals who deal with the "high maintenance" infant or child. Written by Kate Andersen, parent educator and expert on the difficult child, the monthly newsletter is aimed at parents and EIs (early interventionists). B-D-I will cover a variety of topics related to temperament and practical information on coping with stressful interactions and helping others to cope. For a FREE trial newsletter, visit the Newsletter Information page. Kate Andersen hosts the widely read 'Ask Kate' column on this website, which will now be added to the monthly BDINews. 6/11/98 : Meeting in Philadelphia to include Thomas, Chess, Carey and others! Now the most popular pages at this website can be downloaded in .pdf format! These documents can be saved for later use, viewed offline, or printed for distribution. Included is information about temperament research, books about temperament, temperament faqs, etc. Also on the list are 1) a referral form for professionals who wish to try the B-DI Scoring and Report Service for infants and children, and 2) an order form for B-DI products. Just click on the download button! If you don't have Acrobat Reader to interpret .pdf files, a link on the page shows you where to get it FREE! Check downloads.html and see! 4/21/97 : In case you missed it! B-DI has established a Graduate Student discount for Carey Temperament Scales materials purchased for thesis or dissertation research. See Graduate student discount page in the B-DI Online Catalog for details. Sorry, not available from commercial distributors, only orders sent directly to B-DI.